If you believe that conversion vans could not get any better, think again. Reaching new levels in comfort, luxury, and innovation, Sherrod has implemented the latest technology to provide you with reliable family transportation while giving you the upscale feel you desire. 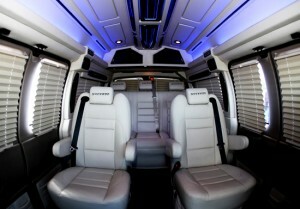 Sherrod redefines luxury with their new GMC SSE conversion van line. Offering top-of-the-line conversion vans on the market, Sherrod’s SSE collection offers you a family-friendly vehicle that will cater to your comfort needs and exceed your transportation expectations. Designed to bring luxury and refinement to your family’s traveling experience, the Sherrod SSE van can be customized to suit your every wish. One glance at the Sherrod GMC conversion van shows the uniqueness of this vehicle. From chrome fender vents and fiberglass running boards to tinted windows and billet grilles, exterior styling makes the Sherrod SSE van stand out on any street. The GMC collection is the epitome of timeless class. Constructed with a durable fiberglass high-top roof, the Sherrod GMC conversion van offers excess headroom and storage space for your family. The aerodynamic design successfully improves your vehicle’s gas efficiency and minimizes wind noise, and a maximum seven-passenger capacity provides enough seating for your entire family. The interior cabin takes your breath away with its 22-inch LCD monitor, mid and rear speakers, courtesy lighting, and drivers command center, which allows you to control all the main cabin features directly from the dash. Ultra leather accentuates the two cockpit and midseat recliners, and the rear couch offers optimal comfort seating. Privacy pleated shades cover all the windows, providing your family with privacy when necessary, and the plush carpet is fire retardant and resistant to water absorption and deterioration. Sherrod’s GMC conversion collection takes lighting to a new level for conversion vans, with low-heat LED lighting situated throughout the cockpit and cabin and indirect lighting distributed across the ceiling and floor panels to give your vehicle a private aircraft feel. Map LED lighting accent the molded cockpit ceiling for reading directions with ease, and LED reading lights provide high-intensity lighting for reading books. 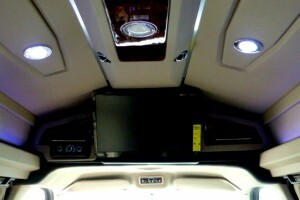 If the upscale design does not quite meet all your demands, the optional upgrades offer an extra zing. Upgrade the interior with a game control center that easily links to your LCD monitor. The optional i-Pod station and SIRIUS XM radio hook up to the navigation system or rear radio, and Sherrod’s GMC collection is Wi-Fi compatible with Sprint accounts. On the exterior, the upgraded tinted windows and painted halo and grille add a stylish touch to the aerodynamic design, and the front air dam spoiler comes with running lights for seeing with ease. As with every family, safety is a huge concern for you. From grab handles and vehicle tools to optional navigation systems and back-up warning sensors, the Sherrod SSE conversion van provides several safety features that will keep your family safe on and off the road. 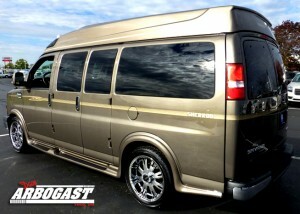 With the GMC SSE conversion van, Sherrod has combined comfort with luxury to give you a timeless family vehicle.